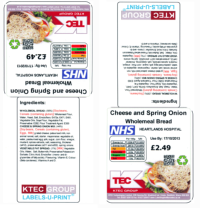 FMS is food recipe labelling software that follows UK Governments FSA legislation by printing correct ingredients, nutrition detail, bolded allergens, quid%, expiry date, barcode and more. Start by entering your basic ingredients once. Then each product can be quickly built using a drag and drop method combining two or more of the ingredients by weight. When the label is printed FMS has arranged all the compound ingredients in the correct weight order. FMS saves hours and hours of editing food labels since if any one ingredient is changed FMS ripples through the database and updates all your products in under a second! The FMS system is ideal for use with our colour label printers that are very high definition up to 4800 dpi excellent for small ingredients printing and colour nutrition detail. FMS includes an ability to create print queues so each day you only need click a button to print that days needs or edit some of the quantities and go. This video shows FMS working with our high speed Memjet roll label printers showing recipe set up, making short work of food labelling. This video shows our award winning work with the Epson label roll printers.